I know. I know. As long as I stay on the deck, she'll let me be outside. How do we manage this? Well, #1-Neither Pilchard, shown here, nor her "sister", Mija, are outdoor cats. They were raised in an apartment. The ability to go out onto a deck, to be out in the air is a novelty. They do get scared of some noises, such as my neighbor's dogs or lawn mowers. They will run back inside if something scares them. #2-I watch them like a hawk when we're outside. They hear, "No," and tend to look to see what I'm "no-ing" about. It's generally starting to go down the deck steps or sticking the head through the slats. Neither one really fits through the slats but where you see the edge of the child gate, there is a slat that is loose and Pilchard knows she can shove it aside and get off the deck if I don't tell her, "No". She lasted about 15 minutes up there and then looked off the deck. 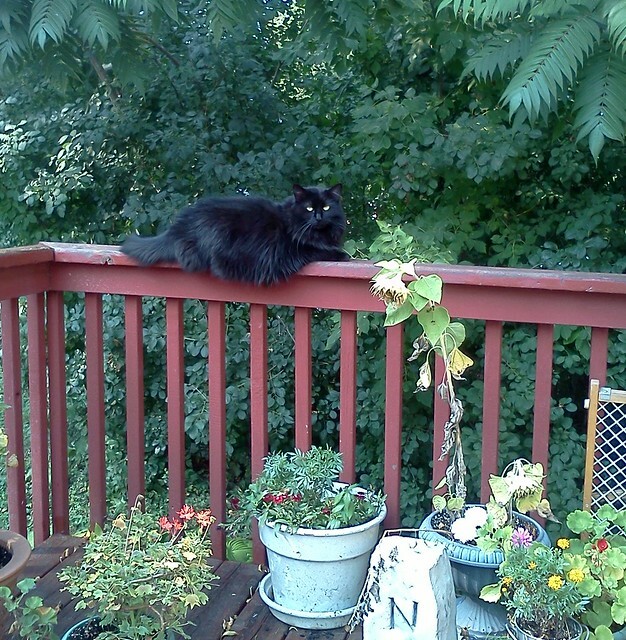 But I said, "Don't even think about it" and she jumped back onto the deck. Maybe in 4 years, I'll be able to have them come outside with me without my having to remind them.